Looking to get Arctic chic, but not quite committed enough to adopt a muskox? We have a simpler solution: new BACARDI® ARCTIC GRAPE™ flavored rum. The cool-as-the-north-pole elixir was created for warm/ hot/ formerly-unbearable-until-the-invention-of-BACARDI-ARCTIC-GRAPE summer days, with real fruit essences that create a chilled, crisp taste that's perfectly potent as a shot, and blends delightfully with lemon-lime soda. BACARDI ARCTIC GRAPE also serves as a tantalizing base for a plethora of cocktails, including the Arctic Refresh, a blessedly uncomplicated concoction almost as easy to make as hitting a button on your browser. The graped-out spirit will amp-up any summer soiree, and will give your friends a far more gratifying polar experience than giving everyone awkward Eskimo kisses. Slide over to the BACARDI ARCTIC GRAPE Facebook page for more info on the ice-cold spirit. For more muskox info, slide over to... a zoologist. 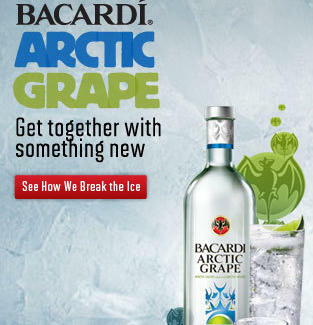 Invent and name your own BACARDI ARCTIC GRAPE mix on Facebook now! ENJOY TOGETHER RESPONSIBLY. Bacardi.com ©2011 BACARDI AND THE BAT DEVICE ARE REGISTERED TRADEMARKS OF BACARDI & COMPANY LIMITED. BACARDI U.S.A., INC., CORAL GABLES, FL. RUM - 35% ALC. BY VOL.